The Writing Back project involves students from a diverse range of backgrounds studying a wide range of degree courses. A few of our students shared their views of their experience working on the project. "Being an international postgraduate student, I would love to connect with as many people as possible because communication with my family and friends back home is often much less than expected or cannot be scheduled for many days, mainly because of the time difference. Letter writing is a practice that should be kept alive even though we live in a digital world and talking with someone is just a click away. I remember the days when I used to send letters to my grandparents and my cousins during holidays before the cell phone became popularised". "My experience of the project has been very fulfilling and insightful. It has been lovely to build links with the local community as I feel that is something which students do not often do. I have found the process very interesting, especially as my pen pal has lived in Leeds all of her life which has evoked interesting discussion about how the city has changed. We have spoken about the Leodis photographic archives and how the city has changed overtime. This has been fascinating for me as I am interested in how the demography of the city has changed as I have only lived in Leeds for a short while. I have learnt how rewarding the process of letter writing can be, especially in the exchange of interests. Both my pen pal Florence and I have a keen interest in poetry and it has been wonderful to discuss the types of poetry that we both enjoy, especially due to the age difference. Florence likes more traditional poetry with rhyming couplets and I both like that and the more modern style. Our exchange of authors in relation to poetry has been very fruitful and Florence also writes poetry, so I have had the pleasure of being able to see what topics interest her personally. The project has thrown light, for me, on the fact that the art of letter writing is dying art and this I feel is a great sadness as the joy of getting a letter through the post is not comparable to receiving a text message or email." "I am currently in correspondence with Joy, whom I have been matched up with on the basis of similar interests. So far this has been a great experience, I have thoroughly enjoyed writing and receiving letters regularly over the past few months. It has been a novelty actually using a pen and paper to communicate with someone and then waiting for a response to arrive, made all the more exciting by the fact that I am due to finally meet Joy for the first time in April at the meet up event. With modern technology communication today is instant and often sadly impersonal. In contrast, the act of writing a letter retains a certain charm and because of this I believe that letter writing should be a tradition that is continued for many more generations to come. It has also been great getting to know someone that I normally wouldn’t encounter on a day-to-day basis. University is often hectic and intense and it can make you forget in the process that there are other people out there besides students. I have thoroughly enjoyed the opportunity to communicate and connect with someone who has a very different life from my own and I am very much looking forward to continuing with the project." 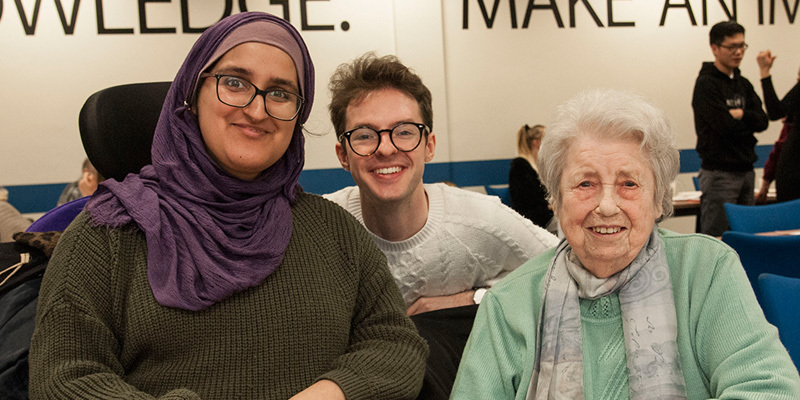 "As an international student, I would really appreciate having a chance to make friends with older residents in Yorkshire. I miss my grandparents a lot. I still remember how happy they were every time I visited them. Company is the best medicine to cure their loneliness."